Nearly 50 million Americans suffer from chronic, recurring headaches, of which over half suffer from migraines. Over 20% of children and adolescents are also headache sufferers. The most sensible route to travel is to establish the type of headache and its most probable cause. Once this is done, the advice for the treatment will be more specific and effective. What type of Headache do I have and what are the more common types of Headache? - Acute headaches: Seen in children, these are headaches that occur suddenly and for the first time and have symptoms that subside after a relatively short period of time. Acute headaches most commonly result in a visit to the pediatrician's office and/or the emergency room. If there are no neurological signs or symptoms, the most common cause for acute headaches in children and adolescents is a respiratory or sinus infection. -Hormone headaches: Headaches in women are often associated with changing hormone levels that occur during menstruation, pregnancy, and menopause. Chemically induced hormone changes, such as with birth control pills, also trigger headaches in some women. -Chronic progressive headaches: Also called traction or inflammatory headaches, chronic progressive headaches get worse and happen more often over time. These are the least common type of headache, accounting for less than 5% of all headaches in adults and less than 2% of all headaches in kids. Chronic progressive headaches may be the result of an illness or disorder of the brain or skull. -Poor Posture: There are countless causes of headaches, but one that is often overlooked is posture. Take a minute to think about how you sit and stand. Now consider how your body feels when you are lying down. Do you experience aches or discomfort around your neck and back? Are there certain positions that seem to cause tension and trigger headaches for you? Poor posture can result in muscle tension within and around the shoulder and neck joints and muscles. It can also exacerbate headache pain stemming from other causes. Some people find that during stressful situations, posture suffers and breathing patterns may become shallow and tensed. For this reason, it can be helpful to focus on correct posture alongside deep breathing. This will allow you to alleviate physical discomfort from a hunched over posture, for example, while also utilising deep breathing exercises to ease the bodily tension that can occur from anxiety and stress. -Avoid sitting or standing in one position for prolonged periods of time. -Sit up straight and use any cushions or back supports for your lower back as needed. -Consider a special headset if you spend a lot of time on the phone. Holding a telephone between your shoulder and head, especially for prolonged periods, can strain muscles and result in sharp tension headaches. -Adjust computer screens so that your neck is not strained. -When lifting anything, especially if it is quite heavy, lift with your arms and legs, not your back. -Mind Your Breathing: Breathing is obviously necessary for existence, yet many of us tend to take shallow, labored breaths. Rarely do most people breathe deeply on a regular basis, but by consciously focusing on breathing and replacing superficial breathing with deeper breaths, you can better oxygenate your body, ease tension and help headache pain. The effects of deep breathing can be quite powerful and it may feel unusual at first, as it is very different from the shallow superficial breathing most people perform. Deep, slower breaths relax the nervous system and provide wonderful physical and emotional benefits for tension, which can really benefit headache pain management. It's also important to learn deep breathing as it assists in releasing tension. Try taking a slow deep breath in to a count of three, and focus on any issues in your life that are stressful and may be triggering headaches and muscle discomfort. Then, release very slowly to another count of three, and imagine your worries dissolving and releasing with your breath. The mind can be a powerful tool when used with deep breathing and may help alleviate headaches triggered by stress. -Tension headaches: Also called chronic daily headaches or chronic non-progressive headaches, tension headaches are the most common type of headaches among adults and adolescents. 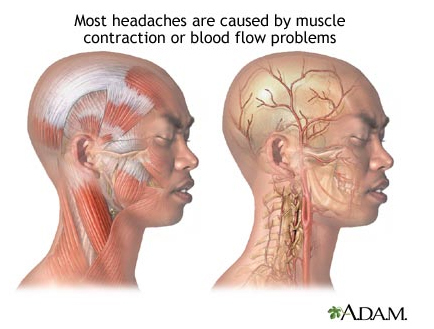 These muscle contraction headaches cause mild to moderate pain and come and go over a prolonged period of time. Muscular tension - Skeletal muscles are made up of muscle fibers, bundled together. Each fiber can contract or relax on demand. All the fibers contract together to shorten a muscle. The command to contract or relax is given by the brain and relayed to the muscle by nerves. When we are under stress, we commonly tense the muscles of the shoulders, upper back, neck and face. This can lead to tension headache. -Migraines: The exact causes of migraines are unknown, although they are related to blood vessel contractions and other changes in the brain as well as inherited abnormalities in certain areas of the brain. Migraine pain is moderate to severe, often described as pounding, throbbing pain. They can last from 4 hours to 3 days and usually occur 1 to 4 times per month. Migraines are associated with symptoms such as light sensitivity; noise or odors; nausea or vomiting; loss of appetite; and stomach upset or abdominal pain. When a child is having a migraine they often look pale, feel dizzy, have blurred vision, fever, stomach upset, in addition to having the above listed symptoms. A small percentage of pediatric migraines include recurrent (cyclic) gastrointestinal symptoms, in which vomiting is most common. Cyclic vomiting means that the symptoms occur on a regular basis -- about once a month. These types of migraines are sometimes called abdominal migraines. -Mixed headache syndrome: Also called transformed migraines, this is a combination of migraine and tension headaches. Both adults and children experience this type of headache. -Cluster headaches: The least common, although the most severe, type of primary headache, the pain of a cluster headache is intense and may be described as having a burning or piercing quality that is throbbing or constant. The pain is so severe that most cluster headache sufferers cannot sit still and will often pace during an attack. The pain is located behind one eye or in the eye region, without changing sides. 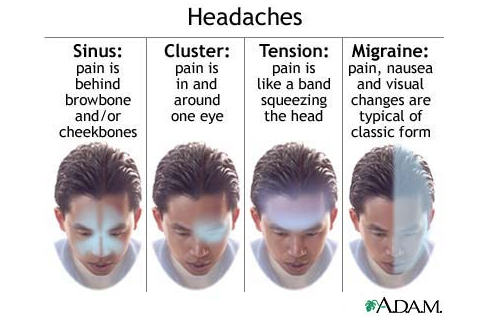 The term "cluster headache" refers to headaches that have a characteristic grouping of attacks. Cluster headaches occur one to three times per day during a cluster period, which may last 2 weeks to 3 months. The headaches may disappear completely (go into "remission") for months or years, only to recur. -Sinus headaches: cause pain in the front of your head and face. They are due to inflammation in the sinus passages that lie behind the cheeks, nose, and eyes. The pain tends to be worse when you bend forward and when you first wake up in the morning. Postnasal drip, sore throat, and nasal discharge usually occur with these headaches. Headaches may occur if you have a cold, the flu, fever, or premenstrual syndrome. Combining good posture with deep breathing exercises not only provides immediate stress and headache relief, but when performed consistently, it can prevent headaches as well. If you regularly work on deep breathing, you may find that eventually, you are breathing at a deeper level without conscious intent. What this means is that you have integrated more relaxed and deep breaths without having to 'force' yourself to breathe differently. Try to find a comfortable standing or sitting position that maintains correct posture and use deep breathing to release tension and stress. The benefit of these techniques is that they can be performed virtually anywhere and you can obtain immediate calming relief. So the next time you experience a headache, consider your posture as a cause and check to be sure you are sitting, lying or standing comfortably. If you find your posture is poor, try adjusting it and also consider adding in deep breathing to provide headache relief. In addition, you may want to consider visiting a physical therapist, who can help you to identify and correct any postural problems that may be triggering or causing your headaches. Keeping your spine and posture healthy as well as using deep breathing for relaxation is all part of headache management. The types of activities that can lead to poor neck posture include sitting at a computer for extended periods of time, reading with the head bent forward, sitting while slouching in a chair or on a couch, sleeping with the head or neck in odd positions, or any other activity that places the head in a position forward to the body. This leads to the conclusion that headaches and neck pain can be caused by sitting at a computer. Headaches can also be triggered by specific environmental factors that are shared in a family's household, such as exposure to second-hand tobacco smoke, strong odors from household chemicals or perfumes, exposure to certain allergens or eating certain foods. Stress, pollution, noise, lighting and weather changes are other environmental factors that can trigger headaches for some people. The good news for headache sufferers is that once a correct headache diagnosis is made, an effective treatment plan can be started. It seems logical that the majority of migraine or tension headaches originate from neck problems. It also seems logical that if we established what was causing these neck problems, and eliminated what was causing them, we could also eliminate the headaches. Chiropractors for example, after examining thousands of patients, discovered that as many as 95% of neck pain and headache patients had one thing in common - a reversed neck curve. From the side view a normal neck should have a slight curve in it. But as many as 95% of headache and neck pain patients had either a lessening of that curve, no curve at all, or a curve that was completely reversed. Your doctor may recommend different types of treatment to try or he or she may recommend further testing, or refer you to a headache specialist. You should establish a reasonable time frame with your family doctor to evaluate your headache symptoms. The proper treatment will depend on several factors, including the type and frequency of the headache and its cause. Not all headaches require medical attention. Refer to “How can I take Care of the problem myself?” Treatment may include education, counseling, stress management and medications. The treatment prescribed for you will be tailored to meet your specific needs if you can provide an accurate account of the headaches. There are many natural remedies. These include stress and tension reduction, ice therapy (used at the base of the skull), eliminating food triggers, getting the proper amount of rest, biofeedback, neck pillows or cushions, exercise and many others. How can I take Care of the problem myself? Under all circumstances, it is advisable to keep a record to help track and identify the source or what event sets off your symptoms. With this information in hand, you will be able to make the necessary changes to avoid future headaches. The information that should be recorded is the date and time the headache began, what you ate for the past 24 hours, how long you slept the night before, what you were doing and thinking about just before the headache started, any stress that you be under, how long the headache lasts, and what event or treatment or behavior patterns made it go away. You may soon see the formation of a pattern which will be most useful. There is no doubt that too much time may create a problem in the neck area that could lead to chronic neck pain and headaches. First, foremost and most important is to keep a check on your posture. People usually develop poor neck curvatures because of poor posture habits. Anything a person does that places their head in a position forward to their body will lessen or reverse their normal neck curve. And poor neck curvatures DO cause head aches. What are some guidelines if long computer hours are the problem? -Take breaks every 15-20 minutes. This should involve getting up, and walking about the room. This will provide a break from using your eyes, promote circulation, and allow the spinal tissues to be exercised to avoid postural strain. -Maintain upright posture at all time. Avoid slumping, or sitting with your feet up. Look straight ahead at your monitor screen. The ideal position is the middle of the screen slightly above eye level. This is different than many ergonomic specialists agree, in that this position is higher. However, this head and neck position is the most favorable for your overall health. So, raise up the monitor height, so that the middle of the monitor is above eye level. This facilitates an improved neck and head position, and therefore reduces abnormal stress and strain upon the neck and shoulder muscles. -Place your feet firmly on the floor in front of you. If you require one, use a foot stool. That is, if your chair and desk configuration does not allow you to have your thighs at a ninety degree or greater angle to the floor, then you may need a foot stool or support. -Use a headset if you are ever on the phone while using the computer. In fact, you should use a headset whenever possible. This will most assuredly reduce strain on your neck and shoulder muscles.